In the last 15 years, coaching sales professionals has been and continues to be one of the key drivers of sales success. In the majority of companies we’ve worked with a coaching program has already been implemented for line sales management. However, only about half of these companies have created a coaching culture. What’s often lacking is a coaching mindset by the senior sales leadership team. Behavior change rarely happens within sales organizations without senior management consistently modeling the desired outcomes and ensuring that line management reinforces a coaching culture. The Fast-Q program requires coaching by line and senior management throughout implementation. If your sales organization has already retained a coaching program, we focus on leveraging the coaching skills previously learned. If not, we can provide a coaching skills foundation. Sales Professionals and management will have completed the PXT SelectTM assessment. A coaching report is provided to the management team for each new-hire. This report provides you with a deeper understanding of the sales professional’s Thinking Style, Behavioral Traits, and Interests in relation to the sales position. Along with some insight into motivations and challenge areas, this report also provides you with useful tips focusing on what to coach. Fast-Q identifies when specific coaching actions need to take place. Critical deliverables are identified for each step of the program. Sales and senior management need to ensure that all parts and pieces making up the organization’s coaching model function effectively. Coaching is about behavior change, both for the sales professional and sales management. 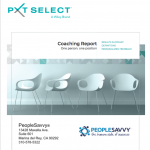 PeopleSavvy has over 100 combined years of sales and sales management coaching experience. We provide in-depth one-to-one coaching to the organization’s management team as they identify their needs. Your management team learns how to change their own behavior and then coach the sales professionals to implement success behaviors.